What will this tutorial teach me? This tutorial aims to show users that are new to Vertex's BNet networking library how to construct a simple multiplayer game in a small amount of time. You should then be able to take the basics learned here and expand on them to create a multiplayer game of much greater complexity. Where can I grab a compiled demo for testing? To test the multiplayer aspect, run server.exe, then run client.exe and hit 'C' to connect. Luigi should now be visible and animate the same across both windows. What do I need to compile the code myself? Place the BNet.mod folder in your BlitzMax/mod/pub.mod/ folder to be able to compile the tutorial code. I get a "CreateUDPStream Failed!" error when running the server. The most likely reason for this error is that the UDP port the server is attempting to open is being blocked by a router or firewall. The default value for the HOSTPORT constant is set to 41219. If you are unsure of how to forward or unblock a port, please refer to www.PortForward.com. If you already have a UDP port open, change the HOSTPORT value to the open port number and the server should run correctly. Function FindWindow(lpClassName$z, lpWindowName$z) = "FindWindowA@8"
In our first section of code, we use the Framework and Import commands to only include the modules that we need when building our EXE. This ensures the EXE will be as small as possible. Next we declare a couple of API functions that we'll be needing in a later function. The lpRect type is for holding the window position that is returned when using the GetWindowRect function. We then give our window a title, set the graphics driver to D3D, and initialize our graphics window. The WindowMode() function is then called to center the window on the user's screen. See the "Junk" section for more info. Global bHost% = False               ' Are you hosting or joining? Global bConn% = False               ' Are you connected? Here we have some public and constant values to be used by network specific code. The commenting should help you understand what each value will be used for. This very important piece of code is the foundation for our reliable UDP packet system. It is important to note that when sending UDP packets under normal circumstances, the packets are not guaranteed to arrive in order, or even to arrive at all. A method must be devised that will make packets reliable, and that can also differentiate between old, new, and duplicate packets. The above Type takes care of the former issue by adding the packets to a type list. We can then resend the packets up to a retry limit, or send them endlessly until a reply is received. The first line in the code creates a NetObj type handle, then creates a TList object to hold the packets. Each NetObj in the NetList represents one data packet. The Create function sends out the initial packet, assigns the packet its permanent SendID, and then returns the packet to be added to the NetList. The SendID is the number each packet carries to identify itself. This value is used later on to determine if the packet is old or a duplicate, so it can be discarded. Only the NET_JOIN and NET_QUIT packets need to be made reliable, the other packets will use a different send method. Print "*** Resent join packet to host, attempt " + Retry + " ***"
If DebugMode = True Then Print "*** Dropped join packet ***"
If DebugMode = True Then Print "*** Resent quit packet ***"
The Handle method is responsible for checking each packet timer to see if it needs to be resent. The NET_JOIN packet is dropped after 20 sends over a period of two seconds. The NET_QUIT packet is never dropped until a response is received because removing a player has to be 100% reliable. Also notice the debug messages here, you can use them to diagnose packet loss issues when compiling the code. First our game images are loaded. These PNG files can be found in the Multi.zip file at the top of the tutorial. We'll need Mario to play the host, and Luigi will be the client, the player who is joining the game. There are tiles for them to stand on, and also a scrolling cloud background to liven things up. Player and client publics are then declared. This basically creates two sets of positions, one for you and one for the second player. The state key lays out which value correlates to each player state. Instead of constantly sending out our position over the network, we send a single state byte for the receiver to handle. 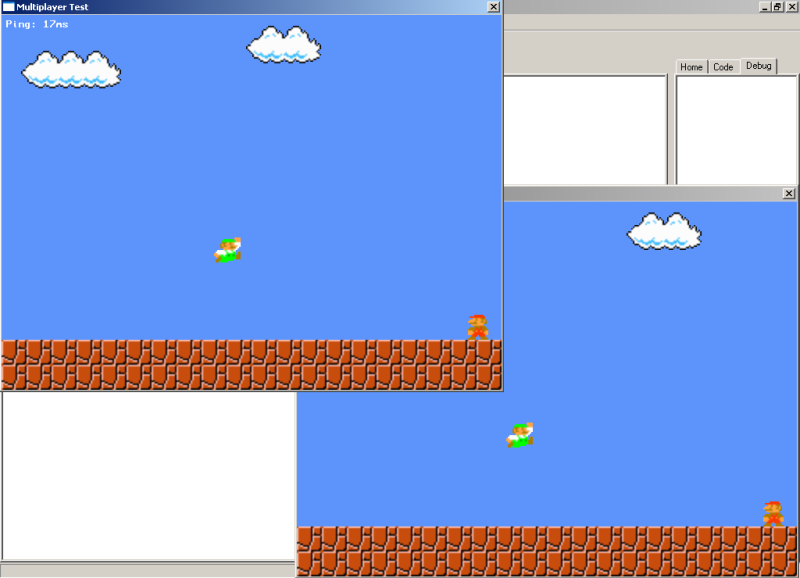 The receiver can then move and animate Mario or Luigi accordingly. This method is what accounts for the smoothness in movement and animation over the network. The HandleInput() function doesn't have a lot to do with networking, only a small section of code near the bottom is relevant. The remainder is very basic input and animation stuff, things that should be pretty self explanatory. The important thing to note is that when the player is idle, the bSentFull flag is checked. If True, the player has moved, and a full update packet is sent. Unlike the NET_STATE packet that contains only the player's current state, the full update packet consists of the player's full position, direction included. This allows the receiver to align your character on his screen whenever you become idle. Lastly, the 'SPACE' key is checked to initiate a jump, and 'C' is used by the client to call up the connect routine. The HandleClient() function is almost an exact clone of HandleInput(), the difference is that this function is responsible for controlling the net player. The cState variable that we receive from our opponent's NET_STATE packet tells us how to move and animate his character on our screen. Another mundane function, HandleJump() controls the jumping and gravity action of both the player and client. UpdateUDP() is where the bulk of our networking code lies. The function is divided into two sections, the top two timer checks are for sending, and the bottom section is for receiving. Let's start with the sending section first. If DebugMode = True Then Print "*** Received duplicate packet, resending ACK ***"
Here we have the answer to our duplicate packet problems, the IsMsgNew function. Every time a packet is received, this function places its SendID into an array. The LastRecv array is later checked for an occurance of the current packet's SendID. If the same ID is found, the packet can be discarded. If the duplicate is a reliable packet, an ACK still needs to be sent in response. RemoveNetObj() is called when an ACK packet has been received. The AckID contains the SendID of the reliable packet that can be removed. NetAck() sends an acknowledge packet that contains the SendID of the reliable packet that was received. The SendUDP function calls the command that actually sends the data packets over the network. bHost is checked to determine where to send the packet, then the SendID public is incremented. tmpConn = 1                   ' We have connected! These last couple of pertinent functions are what begins and closes the network connection. NetConnect adds a single reliable join packet to our NetList, then loops until a response is received, or the TimeOutTime timer is tripped. This means we will resend the join packet for roughly two seconds before giving up. NetDisconnect does basically the same thing, except that it sends a NET_QUIT packet and waits for a response. As aforementioned, the quit packet is never dropped, so we loop continually until a reply is received. What remains are basic functions that handle aspects of the program not directly related to networking. The commenting in each function should explain its purpose. tmpClass$ = "BBDX7Device Window Class"
Enjoyed the tutorial? Comments or questions?